Burger King Sweden is mocking McDonald’s after it recently lost the “Big Mac” trademark it filed for in the European Trademark Court. It surprised consumers with a new menu called “Not Big Macs” for a limited period of time, containing product names that were inspired by feedback regarding McDonald’s Big Mac. 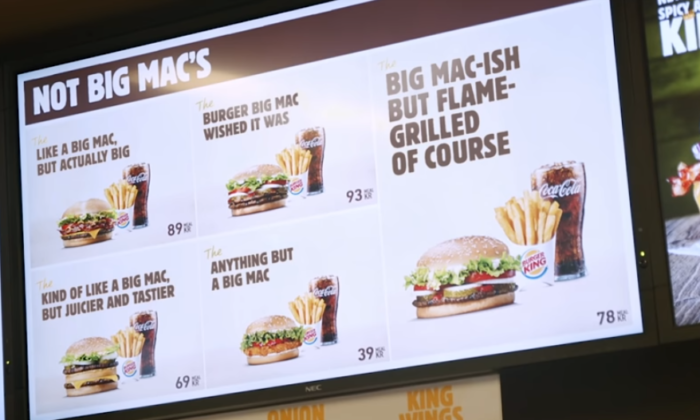 Some of these include, “Big Mac-ish but flame-grilled of course”, “Like a Big Mac but actually big”, “The burger Big Mac wished it was”, “Kind of like a Big Mac but juicier and tastier” and “Anything but a Bic Mac”. “McDonald’s just lost its trademark for the Big Mac for suing a much smaller player. It’s too much fun for us to stay away,” Iwo Zakowski, CEO, Burger King in Sweden said. She added that the “Big Mac-ish but flame-grilled of course” product has been selling well and that the team is aware of its customers’ preferences. The rivalry between both the fast food giants is not only contained within Europe. Just last month, McDonald’s Singapore unintentionally invited a fair bit of criticism from members of the public, as excited netizens took to the internet to share their rather disappointing experiences with the salted egg yolk loaded fries item. While many commented that the product doesn’t taste like what “salted egg yolks” should, Burger King snuck in a witty comment. The King cheekily threw shade at its competitor, while promoting its own product on a netizen post. It said, “We know, the clown did it again. Yet another blunder. Here at Burger King, we never mess with our fries. That is why you should totally get our Cheesy Fries for only SG$2.50”. The two payment giants will launch a mobile real-time top-up service to provide Hong Kong online shoppers with a seamless global e..
Brands big and small are jumping on the online pop-up bandwagon. What can retailers learn from this. ..